October's long dry spell in the northwest of British Columbia may be coming to an end with rain in the forecast, but damage from the prolonged drought — which reached a level 4 warning in some areas — has already impacted wildlife in the region. At the beginning of the week, Prince Rupert had seen only a couple of days of rain in October — which is highly unusual for the typically soggy city. "I've never seen that before," said Valerie Cameron, water stewardship manager with the Ministry of Forest, Lands and Natural Resource Operations. The dry conditions are particularly affecting salmon in the Upper Skeena region, according to Mark Cleveland, head biologist for Gitanyow Fisheries. "We've been seeing unprecedented low water levels," said Cleveland, who hasn't seen anything like it in his 25 years on the job. The Nass River main stem has seen water levels 50 per cent below normal for the past month, he said, and that means salmon are struggling to travel down the water streams for a number of reasons. "Beavers block the entire river in four different locations, salmon are basically stuck behind these beaver dams," he said. "We're also seeing very high predation rates on these salmon from grizzly bears … [The salmon] are sitting ducks, they have to travel tens of kilometres with their backs out of the water." Cleveland said he's worried about how prolonged low water levels will impact the salmons' future. "The long-term impacts are likely going to be very high years down the road," he said. 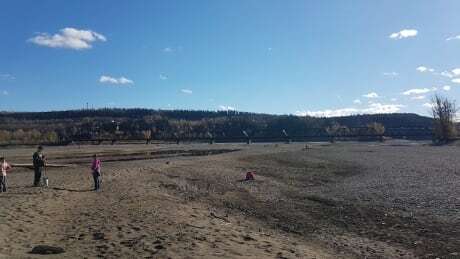 Dean Campbell lives in New Remo, a community just west of Terrace, and compared this month's conditions at his favourite slough to previous years. "The same family of ducks has been coming back, they're back this year but usually they have water to float in," Campbell said. "Right now, they're just kind of sitting in a mud puddle." One water expert warns that drought conditions like this will become the norm and the province needs to prepare. "I don't think either the politicians nor the media have really focused on what we should be doing about adapting to these new conditions because they are going to come more frequently," said Hans Schreier, a UBC professor emeritus of land and water systems. Schreier​ said more needs to be done at a governmental level to better manage water resources. "If we don't act, I think we are going to have all kinds of problems in terms of dealing with these extreme events," he said.